Digger is a graphic novel that started life as a webcomic. Unlike many webcomics, this was not merely a short strip of cartoon humour. Instead, Digger is a long form fantasy epic, told through the medium of a serialised comic strip, almost right from the start. 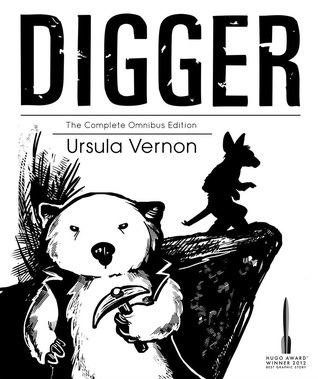 And so Digger - the complete Omnibus Edition is absolutely the best way to read the story. Digger is a wombat, from a world where wombatkind live in warrens and where wombats are a no-nonsense, practical and deeply unspiritual species, concerned primarily with feats of civil engineering. Or so we are told by Digger herself, whom we meet elsewhere. When we first meet Digger, she's in the process of accidentally tunnelling into a different world, through sinister, magic-infested caves that induce hallucinations (and which may contain monsters who want to skin her), and out through the floor of a temple dedicated to an elephant God of compassion and peace and stuff. This is a world where no one has ever seen a wombat themselves (though the species is not unheard of, merely semi-mythical and rumoured to be extinct). What follows is a story that finds its feet by improvising, introducing this strange world and its inhabitants to Digger, before deciding that it was meant to be a tale of epic fantasy all along, and developing a plot to suit. 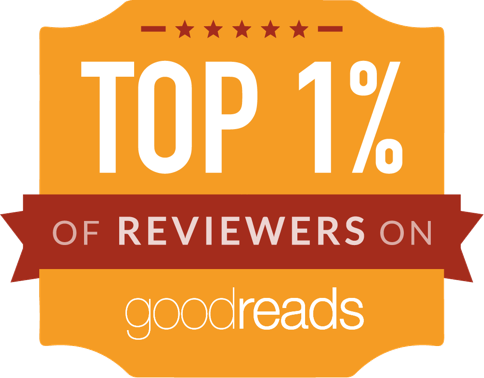 Except, this is an epic fantasy starring a hero who really doesn't like gods, or prophecies, or magic, and who deeply distrusts anyone who foolishly messes around with such unpredictable things. The humour in Digger ranges between wry wit, subverted expectations and slapstick. However, despite plenty of chuckles, Digger is not a work of comic fiction in my mind. Humour serves and enhances the story from time to time - but the story does not serve the humour. In her adventures, Digger encounters joy, triumph, heroism, tragedy, innocence, atrocity, wisdom and stupidity. She may have no stomach for spiritualism or romantic notions of heroism and valour, but she always has time for people (no matter what shape, species or gender those people may have). Digger is one of those works which have a certain kindness at their heart. Often in the course of the story, Digger starts out at cross purposes with a character, but eventually grows to know them. Some become friends and allies. Others don't, but are generally understood by Digger (and the reader) to be decent enough people in their own way (or at least, to be following their own moral logic), even if they happen to be trying to do evil things to Digger and her friends. Digger is a wonderful book. If you took Labyrinth and The Princess Bride and substracted the romance / teen notions of love, but left in everything else magical and wonderful and added a prosaic, impatient wombat civil engineer to the mix, you might - just might - end up with something a little bit like Digger. But you'd have to be a bit of a genius - and Ursula Vernon, it seems, is definitely that. PS: I am selling my copy (with a heavy heart) as I will be moving house soon. Interested in buying it? Get in touch! I am very tempted by this one! I've read Ursula Vernon's work as T. Kingfisher, and really enjoyed her style.